Welcome to this week’s round-up of PCGamesN’s biggest news and best stories of the last seven days. Have a seat, because there was a ton of news this week. 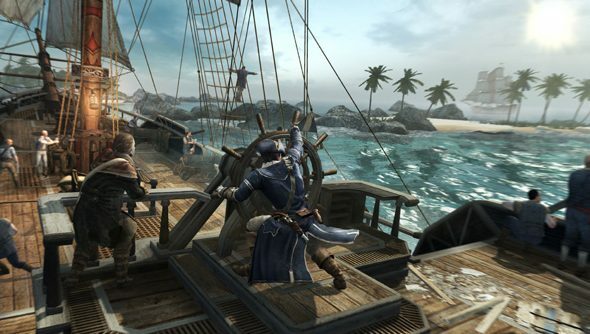 Assassin’s Creed III has come to PC. Enjoy some footage, why don’t you? Planetside 2 launched. It immediately needed new servers. It’s Mechsgiving in the Inner Sphere as the Cataphract Mech and a new map arrived in MechWarrior Online. Steve has been setting things ablaze in Little Inferno. The Technic mod makes some major changes to Minecraft. The case for GTA V on PC. Everything we know about RaiderZ. Steve went hands-on with Ace of Spades, a Minecraft FPS. We interviewed GamrRank’s CEO and COO. I played Gone Home, the indie first-person exploration game from The Fullbright Company. Steve had thoughts and feelings about The Walking Dead. We interviewed Trent Oster about Baldur’s Gate: Enhanced Edition. Blizzard promise tournament servers and resume from replay, which should improve tournament integrity tremendously. They also want more free streams in SC2 eSports, and to focus on developing economies. But they’re not in love with the Neural Parasite ability, and it may not survive Heart of the Swarm. Blizzard also had to regulate when they discovered players were manipulating the PvP arena ranking system. Nami the Tidecaller (mermaid) just joined the League of Legends roster. DreamHack Winter came and went with some good Dota 2 action, and some lackluster finals. World of Tanks is headed to the World Cyber Games in China. Star Citizen passed $5 million, then it broke six million and moved onto development. What could it mean? No dedicated servers in Far Cry 3. Pitched battles come to War of the Roses. Eschalon is not a “dumbed-down ‘RPG for the masses’”. Good to know. Prison Architect has overhauled fog of war. We got a good chunk of Sir, You Are Being Hunted footage. Double Fine are letting you choose their next games. Bioware would also like input on where to go with Mass Effect. Gearbox writer Anthony Burch hosted an in-character AMA. A Planescape: Torment producer and a Betrayal at Krondor developer have teamed up to kickstart a new RPG. More details and videos emerging about Aliens: Colonial Marines. Is it just me, or does that make it sound like the aliens are, in fact, Colonial Marines? Can you imagine the odd-couple buddy movie you could make with such a pairing? Red Orchestra 2 got Steam Workshopped. A former EA developer said that Mirror’s Edge 2 is in production at DICE. DICE’s tech director was not impressed. Yes, this is the most obscure Easter Egg ever. Well done, Battlefield 3! Minecraft Disney World looks pretty good. Peter Molyneux is on the loose, making Godus, which is kind of like Populous! Legend of Dungeon’s Kickstart kicked-off and immediately hit its goal. The Czech government is growing more involved in the saga of the imprisoned Bohemia developers in Greece. Microsoft Games Studios are building games for Win 8. ArenaNet are not entirely happy with how The Lost Shores went. Hitman is too big to be contained by one studio, other studios will be taking over some of the development load. Dizzy has arrived on Kickstarter. Scribblenauts Unlimited was delayed in Europe. Splash Damage are teasing something new. My Little Pony and World of Tanks, together at last. Minecraft comes to the Raspberry Pi. Warface surpasses 5 million subscribers in Russia. Shadowgate made its Kickstarter funding goal. Looks like no multiplayer in Bioshock: Infinite. Damn, there go my hopes for skyline jousting. Maia made its Kickstarter target. Project CARS continues to be gorgeous.